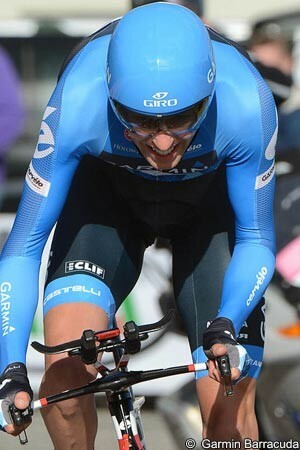 Ryder Hesjedal (Garmin-Barracuda) became the first ever Canadian winner of the Giro d’Italia, as he overcame his 31 second deficit to Maglia Rosa incumbent Joaquim Rodríguez (Katusha) in the race’s final time trial. The 31-year-old stopped the clock in 34’15”, and then waited for Rodríguez to finish behind him; as the Catalan rolled across the finish line 47 seconds slower, the Canadian’s final victory was confirmed. Hesjedal’s final margin of victory was just 16 seconds, making it the closest race since Eddy Merck’s 12 second beating of Gianbattista Baronchelli in 1974, and the fourth closest in history. “I had to fight for this Giro d’Italia,” said Hesjedal afterwards. “As we got off the mountain in the helicopter and as descended to Milan yesterday, I knew I still had a shot. I felt incredible on bike pre-riding and knew I could do it in the time trial. “The first day I pulled on the pink jersey I knew I was good and had accomplished something great,” he explained. “That made me go even harder. Getting compliments from my rivals gave me even more confidence. Hat’s off to them, they’re all great champions but once we were in the third week and I was doing the rides I was doing, I knew it was possible. “My success is down to consistent hard work and by improving a little all the time,” he continued. “I think I showed my ability in the 2010 Tour de France. I had problems in the 2011 Tour but I still showed my ability in the third week. I got the opportunity to focus 100% on the Giro d’Italia this year and the team said I was the designated leader. It doesn’t happen often in a rider’s career to be leader in such a prestigious event, so I came with good legs and wanted to do my very best. Shortly beforehand, stage 20’s Stelvio hero Thomas De Gendt (Vacansoleil-DCM) had easily hauled back the 27 seconds he needed from defending champion Michele Scarponi (Lampre-ISD) to take third place overall; making the first completely non-Italian podium since Switzerland’s Tony Rominger won the 1995 race. The stage was won by former Italian time trial champion Marco Pinotti (BMC Racing) with a time of 33’06”, at an average speed of 51.117kph. The rider from the nearby Bergamo province, whose career was almost ended by a crash in the previous year’s Giro, was 39 seconds quicker than the previous best time, set by Geraint Thomas (Team Sky), with New Zealander Jesse Sergent (RadioShack-Nissan) 53 seconds behind. The course, which had already been altered slightly from that originally published, was changed again due to roadworks in the city. This saw the distance cut from 30km to 28.2km, which gave Hesjedal and De Gendt less kilometres to take aim at Rodríguez and Scarponi. The pan-flat nature of the roads however, would suit the more powerful riders however, making both favourites to overhaul their target riders. Following the previous day’s disqualification of Farnese Vini-Selle Italia sprinter Andrea Guardini, Euskaltel-Euskadi’s Miguel Minguez reassumed the position of Maglia Nera - which he had occupied for most of the race - and it was the 23-year-old Basque rider that had the honour of being first man to start. Stage one time trial winner Taylor Phinney (BMC Racing) was only the third to start however, and was looking to top and tail the Giro with another victory here. His hopes were dashed however, as the race moto that he was following led him off course and he was forced to turn around. Despite the incident, Phinney caught and passed both minute man Adrian Saez and two minute man Minguez (both Euskaltel-Euskadi) to cross the line first; his time of 34’37” may have looked impressive at first sight, but was not to be at the top for long. Just a few minutes later Alex Rasmussen (Garmin-Barracuda) - who might have won the equivalent stage the previous year, but for a late puncture - went 31 seconds quicker; setting a time of 34’06”. World road race champion Mark Cavendish (Team Sky) could mathematically take back the Maglia Rossa points jersey from Rodríguez, but needed to finish the stage in the top fifteen. The Manxman has performed well in short distance time trials in the past, but his finishing time of 35’52” meant that it was not going to be this year. Dressed in the maple lead skinsuit of Canadian champion, on what could be the biggest ever day for Canadian cycling, Svein Tuft (Orica-GreenEdge) went close to Rasmussen’s time at the early checkpoints, but ultimately finished 22 seconds slower to go into provisional second. With Rasmussen having sat in the hot seat for less than 13 minutes however, Jesse Sergent (RadioShack-Nissan) blitzed around the course to become the first rider to dip below 34 minutes, with a time of 33’59”. This was to stand for some time, with the only real challenge coming from Polish riders Michal Kwiatkowski (Omega Pharma-Quick Step) and Maciej Bodnar, who were just seven and ten seconds slower respectively, at the first checkpoint after 12.7km. They had both gone out a little too fast however, and faded in the second half, with Kwiatkowski 31 seconds slower at the finish - outside the time of Tuft - and Bodnar 22 seconds outside, to go into provisional third. Ian Stannard (Team Sky) too was pushing the New Zealander’s time all the way around, but finished 31 seconds slower to slip into provisional fifth. The Englishman was laying down markers for Welsh teammate Geraint Thomas though, who - almost an hour later - flew around the first sector four seconds faster than Sergent. Thomas was seven seconds up at the second checkpoint, after 22.3km, and the Welshman got faster in the closing kilometres to stop the clock in 33’45”, fourteen seconds quicker than Sergent, and moved into the lead. There were very few riders to come that were likely to threaten Thomas’ time, bit one of those was Marco Pinotti (BMC Racing). The former Italian champion caught and passed Branislau Samoilau (Movistar) for one minute, and Emanuele Sella (Androni Giocattoli-Venezuela for two, before he had even reached the first checkpoint, and flew through it some 15 seconds faster than the Team Sky rider. If Thomas was hoping that Pinotti had misjudged his effort and gone out too fast, he was to be disappointed as the Italian flew through the second checkpoint, with his lead now up to 26 seconds. As he closed in on the rear view of three-minute man Stefano Pirazzi (Colnago-CSF Inox), the BMC Racing rider stopped the clock in 33‘06”, an incredible 39 seconds faster than Thomas’ time. Fifth place in stage one, Gustav Larsson (Vacansoleil-DCM) was a potential winner, and the Swedish champion was going well around the flat course. After crossing the first checkpoint in seventh place, he improved to fifth at the second, but this was where he was to finish, in 34’20”, 1’14” behind Pinotti. The top riders in the general classification were now beginning to start; De Gendt was chasing Scarponi, just 27 seconds ahead of him and, if he was having a very good day and Rodríguez a very bad one, he might even overhaul the current Maglia Rosa. Hesjedal meanwhile should be safe from De Gendt, with his lead of 1’47”, but he was looking straight ahead in the rankings at the 31 second gap between himself and the first ever Canadian Grand Tour victory. Despite an improvement in the discipline this year, Rodríguez’ time trialling Achilles heel made Hesjedal the favourite. On the road De Gendt was behind Basso, while Hesjedal was behind Scarponi; while neither rider was likely to make up the two minute margin, both Italians would be a useful carrot to chase. De Gendt crossed the first checkpoint in 13’56”, 28 seconds slower than Pinotti had been, but the more important comparisons would be with the riders behind him. Scarponi was already slower, but with 14’07” had only conceded eleven seconds to the Belgian and looked like he might possibly hold on. Hesjedal meanwhile, was a second quicker than De Gendt, meaning that - as expected - his only battle was to be with Rodríguez. This was a battle that the Catalan was already losing however, as his shoulders rocked with the big gear that he was turning; his time of 14’24” meant that he had lost 29 seconds of his lead, and he now had just two seconds to spare. He lost this inside the next kilometre as his pace continued to struggle, and now looked in danger of also losing out to De Gendt. The Belgian was still going well, bettering Alex Rasmussen’s time at the second check, with 24’32”; as Scarponi went through in 25”04” behind him, his podium place was gone. All the Lampre-ISD rider could hope for now was a total capitulation from the rider in the Maglia Rosa behind him. Hesjedal matched De Gendt’s time at the checkpoint, while Rodríguez - going through in 25’16” - was now officially out of pink, but not far enough behind Scarponi or De Gendt to lose his podium spot. Basso crossed the line in 35’12”, in what was a respectable time by his standards, but De Gendt was not far behind him and sprinted across the line in 34’07”, to go into provisional fifth. Scarponi’s finishing time of 35 minutes dead - in what was arguably the time trial performance of his life - confirmed that the Belgian had overtaken him. Hesjadal was not far behind him, and stopped the clock in 34’15”; he had lost three seconds to De Gendt, but this didn’t matter, he had just two and half minutes to wait to become the first ever Canadian to win the race. Rodríguez was approaching, but not fast enough, and Hesjedal’s time ticked by as he passed the 500 metres to go banner. He too had ridden his best ever time trial, but it had not been enough and, as he stopped the clock in 35’02”, Hesjedal’s victory was confirmed. POL 12 Michal Kwiatkowski (Omega Pharma - Quickstep) s.t. ITA 23 Giacomo Nizzolo (RadioShack - Nissan) s.t. ITA 24 Michele Scarponi (Lampre - ISD) s.t. LAT 33 Gatis Smukulis (Katusha Team) s.t. EST 35 Tanel Kangert (Astana Pro Team) s.t. ITA 39 Domenico Pozzovivo (Colnago CSF Bardiani) s.t. GER 42 Grischa Niermann (Rabobank Cycling Team) s.t. ITA 43 Eros Capecchi (Liquigas - Cannondale) s.t. COL 53 Rigoberto Uran (Sky Procycling) s.t. RUS 55 Evgeni Petrov (Astana Pro Team) s.t. ITA 57 Marzio Bruseghin (Movistar Team) s.t. BLR 64 Branislau Samoilau (Movistar Team) s.t. BEL 70 Francis De Greef (Lotto - Belisol Team) s.t. AUS 75 Luke Roberts (Team Saxo Bank) s.t. AUT 77 Thomas Rohregger (RadioShack - Nissan) s.t. CZE 83 Roman Kreuziger (Astana Pro Team) s.t. POL 86 Sylvester Szmyd (Liquigas - Cannondale) s.t. FRA 90 Hubert Dupont (Ag2R - La Mondiale) s.t. POL 94 Michal Golas (Omega Pharma - Quickstep) s.t. ESP 95 Daniel Moreno Fernandéz (Katusha Team) s.t. UKR 99 Volodymyr Gustov (Team Saxo Bank) s.t. BEL 104 Kevin Seeldraeyers (Astana Pro Team) s.t. ITA 106 Enrico Gasparotto (Astana Pro Team) s.t. USA 111 Peter Stetina (Garmin - Barracuda) s.t. ITA 116 Daniele Pietropolli (Lampre - ISD) s.t. ITA 117 Alessandro Spezialetti (Lampre - ISD) s.t. ITA 118 Matteo Rabottini (Farnese Vini - Selle Italia) s.t. ESP 121 Sergio Pardilla Bellon (Movistar Team) s.t. SUI 137 Andreas Dietziker (Team NetApp) s.t. ITA 123 Mirko Selvaggi (Vacansoleil - DCM Pro Cycling Team) s.t.